It’s the return of the cake minis! This time with a fall flavor twist. 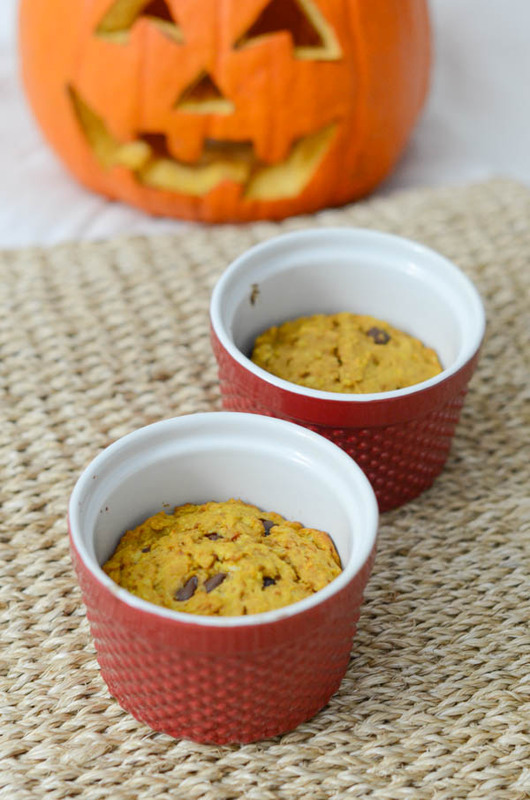 I give you my Healthy Pumpkin Oatmeal Chocolate Chip Cake Minis Recipe. And you’ll be seeing another angle of this recipe in my next What I Eat in a Day video on my YouTube channel, which I’ll be editing (and hopefully) uploading tonight after my post-work workout. Update: I linked the video at the end of this post, just before the recipe. I’ve tried many canned pumpkin recipe experiments of the years. 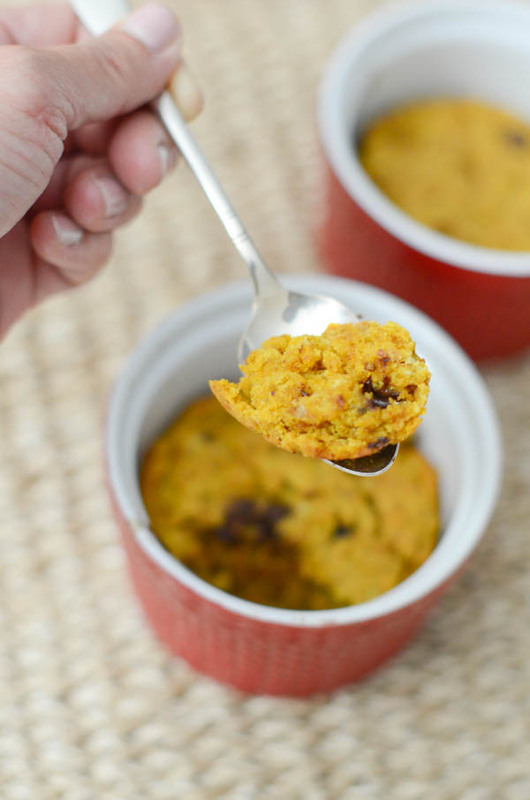 The thing is, you can use pumpkin to make a recipe healthier. I’ve seen canned pumpkin touted as being a substitute for both eggs and oil. And while I did use that trick (on both accounts) in this recipe, it does come with some impacts to the result. Primarily, the cake is quite dense. In the past, I had some recipe experiments that seemed to never quite bake all the way through. It was like the pumpkin overwhelmed the flour or something. Lol. This time, I got a cooked-through center. But it’s still pretty dense. Almost brownie like. Side note: pumpkin in cookies will make it almost impossible (and I haven’t seen it done yet) to get that nice, chewy-crispy cookie texture. They’re almost more like…muffin tops! Lol. 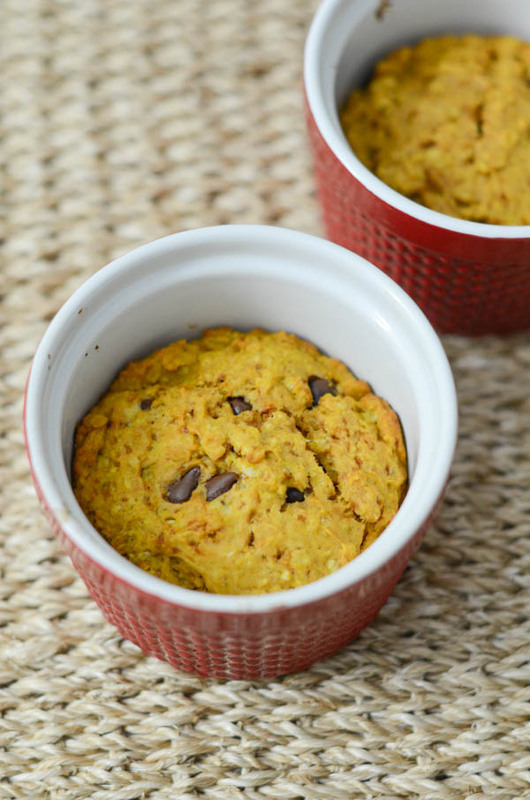 But if you know of a chewy-crisp pumpkin cookie recipe, send it my way please! Also in the past, I considered these recipes a fail. But I think pumpkin desserts kind of are what they are. And especially if you’re eating this cake straight out of the ramekin while it’s still warm (which I recommend), you probably will hardly notice. So, instead, I’m calling this cake a winner. Though I do want to set expectations. One thing I’ve noticed over the years as more and more healthy desserts come around is that it seems understood that healthi-fied versions of desserts do come with some side effects. But, I did want to give you a heads up in case you try out this recipe expecting something that has the same flavor profile as a cake made with tons of butter and sugar. This one is different. And I think in a good way! It’s rich without making you feel bad after you eat it. And hey, I even snuck in oatmeal and pumpkin in there. So, there are some good things you can add to your diet with this one. Woop! Now you can make this, enjoy your cake, and move on to the next round of eats. Easy! 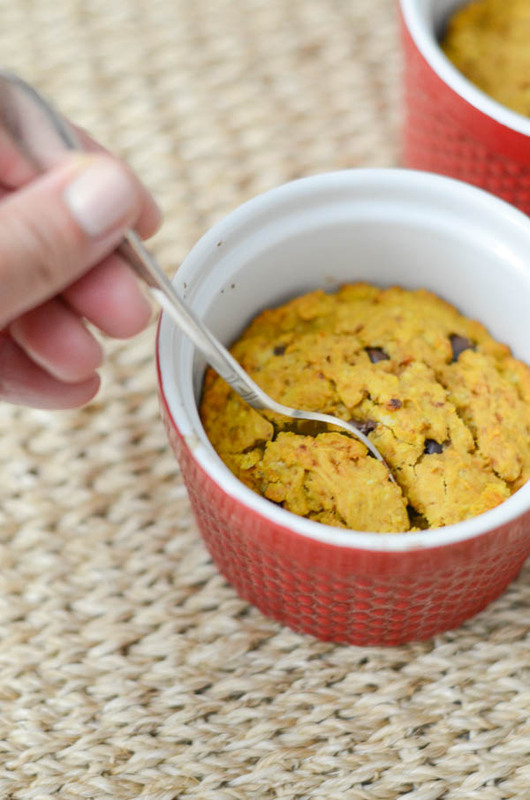 Though it’s not a “recipe video”, I do feature this Healthy Pumpkin Oatmeal Chocolate Chip Cake Minis Recipe in my latest What I eat in a Day video, which I’ll share here. You’ll want to skip towards the end if you’re only interested in the cake. 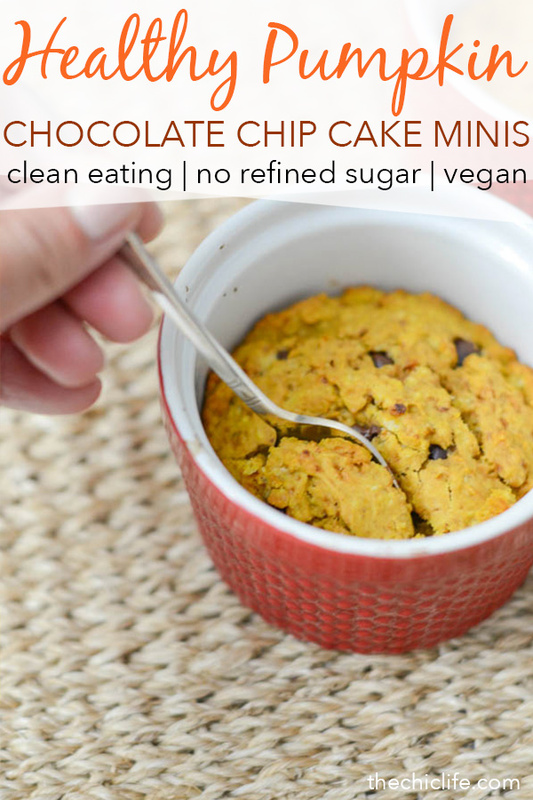 This Healthy Pumpkin Oatmeal Chocolate Chip Cake Minis Recipe is delicious without being overwhelming. Enjoy this any time of year, though I do especially enjoy it in the fall. Note: this recipe is vegan if you use vegan chocolate chips. Pre-heat oven to 350 degrees F. Prepare two ramekins by brushing the inside area with oil. In a medium bowl, whisk together flour, oats, baking powder, cinnamon, and salt. Stir in chocolate chips. In another medium bowl, whisk together pumpkin, almond milk, sucanat, oil, and vanilla extract. Mix wet ingredients into dry ingredients, careful to not overmix. Bake for 18-20 minutes, or until the cakes are cooked through (test by inserting a toothpick inside the center of the cake – if it comes out clean, they’re ready. If batter sticks to the toothpick, they need to cook a bit longer). Let cool until safe to eat and then scoop straight out of the ramekin to enjoy! Note: I used ramekins that 3″ diameters. I got them at Crate and Barrel. Breakfast Apple Crisp (Individual) – a dessert so healthy, you can enjoy it for breakfast! Thanks for reading! 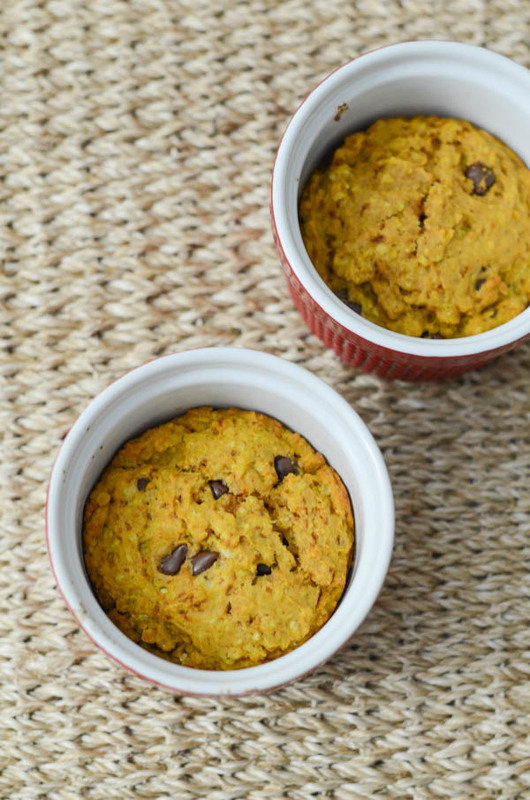 Hope you enjoy this Healthy Pumpkin Oatmeal Chocolate Chip Cake Minis Recipe!